SALT LAKE CITY - Miller Sports Properties along with Salt Lake City and Smith's Food & Drug Stores, Inc., announced today a new multi-year partnership and naming rights agreement for the Salt Lake Bees home stadium to be known as "Smith's Ballpark" beginning with the 2014 season. "As a city, we are very proud of this facility and the teams that call it home. We are fortunate to be able to enjoy Triple-A baseball here and we look forward to spending another summer watching baseball, picnicking on the grass and enjoying the fireworks at Smith's Ballpark," remarked Mayor Becker of the announcement. Smith's Food & Drug began as a single store in Brigham City, Utah in 1932. Today, as a division of the Kroger Co., the company's commitment to friendly service and strong community support has remained a part of its culture. Smith's has 6,700 Utah associates serving customers throughout 47 stores. With the christening of Smith's Ballpark, the 15,411-seat natural grass facility celebrates its 20th anniversary this year as the home of the Bees, the Triple-A affiliate of the Los Angeles Angels. More than 500,000 fans have come to watch Bees baseball at Smith's Ballpark in three of the last four years, and in June of 2013, the ballpark welcomed its 10-millionth fan through the gates since its dedication on April 9, 1994. "We are delighted to join the Salt Lake Bees and Salt Lake City in this exciting partnership," said Jay Cummins, Smith's president. "This is a wonderful opportunity for Smith's to help create lasting memories for Utah families within this beautiful ballpark." The six-year naming rights agreement between Smith's and the Salt Lake Bees includes exclusive sponsorship and advertising rights and prominent signage on the stadium's exterior façade along 1300 South, the team's scoreboard in right center field and in numerous locations throughout the ballpark. Smith's will continue to sponsor Smith's Family Night where families can get a four-pack of tickets and four hot dogs for $20 on Monday nights through the 2014 season. "The hometown grocer is being united with the hometown baseball team, and we think it's a perfect fit as this partnership reflects our joint interests in sports, community service, and healthy living," said Steve Miller, president of Miller Sports Properties. "We are thrilled to have Smith's aligned with our ballpark, and we look forward to working together to enhance the quality of life for all our fans." 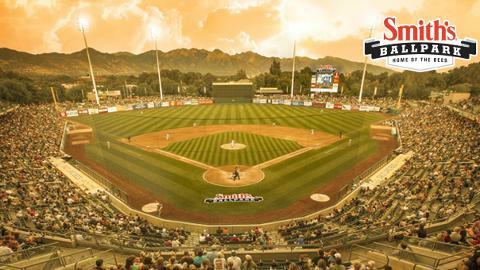 With the Wasatch Mountains as a backdrop, the Bees ballpark is considered one of most beautiful settings in professional baseball. The facility features seating that curves toward the playing field to enhance site lines from every seat, hospitality suites in one of the closest upper decks in the nation to offer fans the amenities of comfort without sacrificing proximity to the field, a grassy outfield berm for picnics, a variety of food options from All-Star Catering, and championship-caliber baseball. Since its opening nearly 20 years ago, the ballpark has hosted a major league exhibition game between the Colorado Rockies and the Seattle Mariners in 2013, Triple-A All-Star Games in 1996 and 2011, Mountain West Conference Baseball Tournament in 2005, home games for the University of Utah baseball team and four appearances by Salt Lake in the Pacific Coast League Championship Series. The defending Pacific Conference Champion Bees begin their season on April 3 with an eight-game homestand at Smith's Ballpark against Sacramento and Fresno. 2014 Bees season tickets are on sale now with prices starting at just $576 per person. Purchase today by calling (801) 325-BEES (2337) or by visiting www.slbees.com with no online fees.